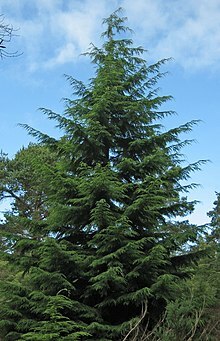 Western hemlock is a large evergreen coniferous tree growing to 165–230 ft (50–70 m) tall, exceptionally 273.42 ft (83.34 m), and with a trunk diameter of up to 9 ft (2.7 m). It is the largest species of hemlock, with the next largest (mountain hemlock, T. mertensiana) reaching a maximum of 194 ft (59 m). The bark is brown, thin and furrowed. The crown is a very neat broad conic shape in young trees with a strongly drooping lead shoot, becoming cylindric in older trees; old trees may have no branches in the lowest 100–130 ft (30–40 m). At all ages, it is readily distinguished by the pendulous branchlet tips. The shoots are very pale buff-brown, almost white, with pale pubescence about 1 mm (1⁄32 in) long. The leaves are needle-like, 5–23 mm (3⁄16–29⁄32 in) long and 1.5–2 mm (1⁄16–5⁄64 in) broad, strongly flattened in cross-section, with a finely serrated margin and a bluntly acute apex. They are mid to dark green above; the underside has two distinctive white bands of stomata with only a narrow green midrib between the bands. They are arranged spirally on the shoots but are twisted at the base to lie in two ranks on either side of the shoot. The cones are small, pendulous, slender cylindrical, 14–30 mm (9⁄16–1 3⁄16 in) long and 7–8 mm (9⁄32–5⁄16 in) broad when closed, opening to 18–25 mm (23⁄32–31⁄32 in) broad. They have 15–25 thin, flexible scales 7–13 mm (9⁄32–1⁄2 in) long. The immature cones are green, maturing gray-brown 5–7 months after pollination. The seeds are brown, 2–3 mm (3⁄32–1⁄8 in) long, with a slender, 7–9 mm (9⁄32–11⁄32 in) long pale brown wing. Western hemlock is closely associated with temperate rain forests, and most of its range is less than 100 km (62 mi) from the Pacific Ocean. There is however an inland population in the Columbia Mountains in southeast British Columbia, northern Idaho and western Montana. It mostly grows at low altitudes, from sea level to 600 m (2,000 ft), but up to 1,800 m (5,900 ft) in the interior part of its range in Idaho. It is a very shade-tolerant tree; among associated species in the Pacific Northwest, it is matched or exceeded in shade tolerance only by Pacific yew and Pacific silver fir. Young plants typically grow up under the canopy of other conifers such as Sitka spruce or Douglas-fir, where they can persist for decades waiting to exploit a gap in the canopy. They eventually replace these conifers, which are relatively shade-intolerant, in climax forest. However, storms and wildfires will create larger openings in the forest where these other species can then regenerate. Initial growth is slow; one-year-old seedlings are commonly only 3–5 cm (1 1⁄8–2 in) tall, and two-year-old seedlings 10–20 cm (4–8 in) tall. Once established, saplings in full light may have an average growth rate of 50–120 cm (20–47 in) (rarely 140 cm, 55 in) annually until they are 20–30 m (65–100 ft) tall, and in good conditions still 30–40 cm (12–16 in) annually when 40–50 m (130–165 ft) tall. The tallest specimen, 82.83 m (271 ft 9 in) tall, is in Prairie Creek Redwoods State Park, California (United States). It is long-lived, with trees over 1200 years old known. Western hemlock forms ectomycorrhizal associations with some well-known edible fungi such as chanterelles (Cantharellus formosus, C. subalbidus, and Craterellus tubaeformis). It is capable of associating with wood-decay fungi in addition to soil fungi; this enables its seedlings to survive on rotting stumps and logs. Western hemlock is the state tree of Washington. Western hemlock is cultivated as an ornamental tree in gardens in its native habitats and along the U.S. Pacific Coast, where its best reliability is seen in wetter regions. In relatively dry areas, as at Victoria, British Columbia, it is exacting about soil conditions. It needs a high level of organic matter (well-rotted wood from an old log or stump is best; animal manures may have too much nitrogen and salt), in a moist, acidic soil. It is also cultivated in temperate regions worldwide. It has gained the Royal Horticultural Society's Award of Garden Merit. When planted well upon the banks along a river, western hemlock can help to reduce erosion. Outside of its native range, western hemlock is of importance in forestry, (as a softwood) for timber and paper production, it is used for making doors, joinery and furniture. It can also be an ornamental tree in large gardens, in northwest Europe and southern New Zealand. It has naturalised in some parts of Great Britain and New Zealand, not so extensively as to be considered an invasive species, but an introduced species tree. ^ Farjon, A. (2013). "Tsuga heterophylla". The IUCN Red List of Threatened Species. IUCN. 2013: e.T42435A2980087. doi:10.2305/IUCN.UK.2013-1.RLTS.T42435A2980087.en. Retrieved 14 December 2017. ^ "Tsuga heterophylla". Natural Resources Conservation Service PLANTS Database. USDA. Retrieved 12 December 2015. ^ a b Packee, E.C. (1990). "Tsuga heterophylla". In Burns, Russell M.; Honkala, Barbara H. Conifers. Silvics of North America. Washington, D.C.: United States Forest Service (USFS), United States Department of Agriculture (USDA). 1 – via Southern Research Station (www.srs.fs.fed.us). ^ Dunham, Susie M.; O'Dell, Thomas E.; Molina, Randy (2006). "Forest stand age and the occurrence of chanterelle (Cantharellus) species in Oregon's central Cascade Mountains" (PDF). Mycological Research. 110: 1433–40. doi:10.1016/j.mycres.2006.09.007. PMID 17123812. Archived from the original (PDF) on 2011-08-14. ^ Trappe, MJ (May–Jun 2004). "Habitat and host associations of Craterellus tubaeformis in northwestern Oregon". Mycologia. 96 (3): 498–509. doi:10.2307/3762170. PMID 21148873. ^ "State Symbols". Washington State Government. Archived from the original on 2007-11-15. ^ "RHS Plant Selector – Tsuga heterophylla". Retrieved 7 June 2013. ^ "AGM Plants - Ornamental" (PDF). Royal Horticultural Society. July 2017. p. 103. Retrieved 27 December 2018. This page was last edited on 1 March 2019, at 11:50 (UTC).